It's launch time! The NDA has expired, reviews are rolling in. I'm betting even though I ordered in the first 15 min (got a couple errors submitting the order), I'm in the second Vive wave, so I doubt I'll get my headset till April 15 or later. It's probably a good thing. I have a lot to get done before then. I'm impressed with the tracking volume testing UploadVR did. That pretty soundly counters a lot of the speculation about the Rift's tracking inadequacy compared to room scale Lighthouse tech. True, it seemed to have a nice wide field of view, although I have to admit I laughed when he hit his head on the chair. Gonna need a padded room! Yeah. Even with the Vive chaperone system, that's really just trading dedicated-space requirements against immersion-breaking, though. That tradeoff is the reason I don't see room-scale sweeping the industry the way many vocal Vive proponents do. Thatt's definitely the question. Is it going to be a world-changing feature that moves everything forward as a whole, or a Wii that disappears in a generation? I have to say, the immersion of involving your entire body is intense. It really made me buy into it in a way that I didn't before experiencing it first hand. I'm betting non-gaming experiences push it forward as much as games, (tilt brush, photogrammetry, etc). That's something I could see non gamers being really excited about. "Want to walk around the floor of the ocean? How about the surface of Mars?" It's all first gen, but after trying it I'm more excited for it than any other tech in recent history. 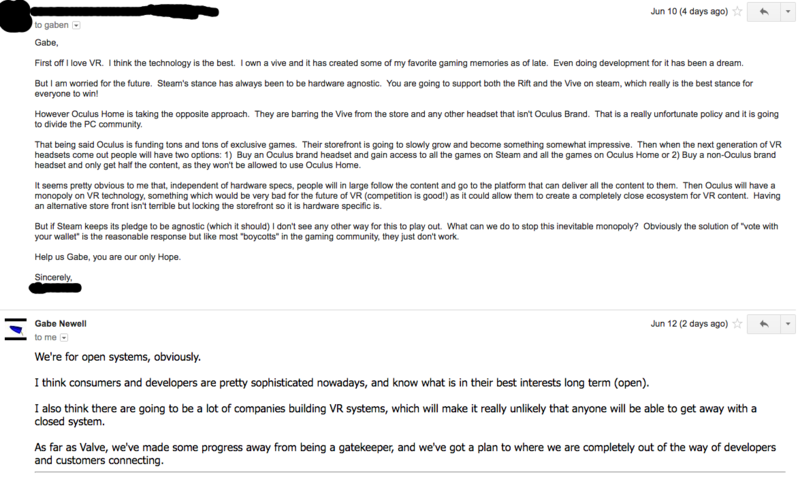 One other point I was considering, I'm also excited about the potential for Devs at room scale. They'll be able to focus more on gameplay and tight experiences than having to pad out a 50 hour collection playtime. I don't believe the expectation will be 60$ exceedingly long (and padded) games. It's a new wild wild west, I'm excited to see some new and really innovative experiences come out of it. Here's an "elastic" locomotion system designed by a studio releasing an exploration myst type game. So, I got my Vive last Thursday, and I have to say, this is the ground floor, gentlemen. It is world changing. It could use more resolution, but when you're inside, you honestly don't care anymore. 10 years from now (perhaps even 5) we'll be using VR headsets for everyday tasks, just wait. AR* headsets for everyday tasks. They make much more sense for everyday use; VR makes more sense for games. Think Microsoft Hololense but with the entire visor being the active display area instead of a small square projected onto it. Good point, although I expect VR to get to mainstream faster. AR will be more impressive in the long run, but I think it'll take longer for tech to get to consumer level. This week at Fanfest 2016, CCP Games has announced that EVE: Valkyrie will not only find its way to all three major VR headsets, but will also allow cross-platform play between them. We went hands-on with PC and console versions of the game to see how the experiences will compare. While EVE: Valkyrie started its life as an Oculus exclusive title, it wasn’t long before the game was announced to eventually be launching on Sony’s PSVR, with the existing exclusivity agreement apparently only addressing Oculus exclusivity on the PC platform. Now it’s been revealed that not only will the game also come to the HTC Vive through SteamVR (making the Oculus exclusivity seemingly time-based) but it will allow players from each platform to battle or team up with one another. Cross-platform play between PCs and consoles has been something long desired by gamers and while it’s been attempted in one form or another throughout the years, it remains quite a rarity, with seemingly little business incentive to drive the feature. When it comes to VR however, it clearly benefits a company like CCP to open up to as many VR players as possible, not only for sales, but to keep the multiplayer population at a healthy size. A longstanding question about the logistics of cross-platform play has long been whether one platform could have an unfair advantage over another, possibly due to differing control schemes (keyboard & mouse vs. gamepad), or hardware performance. We’ll have to wait to see what the stats bare to see if there’s any appreciable difference in the deadliness of EVE: Valkyrie players from one platform over another, but in the meantime we’ve done a hands-on with the Rift and PSVR versions to compare the game between PC VR and console VR. The latest builds were available at Fanfest 2016 where I played essentially the same demo back-to-back. There’s no doubt that the Rift delivers the higher fidelity, however, Sony’s headset is no slouch, with great optics and display quality. While the headset feels heavier, it has equally good weight distribution, and thanks to the reprojected 120 FPS display, EVE: Valkyrie on PSVR is an impressive match for visual comfort too. Fitting the headset, I was greeted by the ‘out of camera range’ message, likely to be a regular sight for PlayStation users, with the tracking volume being noticeably smaller than the Rift. For a seated experience like EVE: Valkyrie—which doesn’t demand that you do much leaning—it isn’t a major issue once you’re lined up. The second notable difference is the aliasing which swims across the angled HUD elements in the cockpits in a somewhat distracting fashion during the launch sequence. It’s soon forgotten with the acceleration into the vastness of space during the launch sequence, followed by the moment of silence, which remains stunningly effective. In terms of performance, there was no sign of wavering from the target framerate on PSVR, even when faced with multiple explosions, ships and debris (although the mirrored ‘Social Screen’ TV output does stutter here). The action is so frantic, it’s easy to ignore the lower quality objects, but there are times when your focus dwells on a passing asteroid that you wish would resolve with finer detail. Overall however, CCP has managed to retain most of the visual flair of the PC version, and most importantly, all of the gameplay. Hopefully, this promises a level playing field for the cross-platform play between Rift, Vive and PSVR. When it was confirmed that EVE: Valkyrie would be coming to the HTC Vive, most assumed it would simply utilise a gamepad instead of the kit’s position-tracked controllers, much like Elite: Dangerous. That may well not be the case, however. Developer CCP Newcastle is looking into bringing support for the Vive’s position tracked controllers to its multiplayer VR dogfighter. I heard that last week at EVE Fanfest, and decided to ask CCP Games CEO Hilmar Veigar Pétursson about the possibility directly. When I first asked him if the company was experimenting with support for what he calls the “Vive wands”, Pétursson flat out confirmed it was in the works. Asking after it further, the CEO told me that finding a way to fit these controls in would be “challenging” but it would be “awesome” and that motion controls in Valkyrie “should be a thing”. Of course, you’ll still be able to play Valkyrie on Vive with a standard gamepad, which in itself raises some interesting questions. If motion control players were able to fire blindly, wouldn’t that give them a huge advantage over those with a gamepad? And how could all of this factor into the recently announced cross-platform play between the Oculus Rift, HTC Vive and PlayStation VR? Perhaps the answer lies in dedicated matches and game types. There’s also no guarantee that such support will be ready in time for the launch of the HTC Vive version, which itself is yet to be dated. If not at Vive launch, then it’s easy to envision a motion control update for EVE: Valkyrie arriving later down the line, similar to the update planned for this summer that’s set to add a new map, Crossroads, and a Carrier Assault mode. With cross platform play, you'd think one method of input would definitely be superior. Of course, on PC players can already go HOTAS vs Gamepad vs KB+Mouse, and that seems to work OK, so maybe it won't make that big a difference. Eh. Yes and no. HOTAS vs. KB+Mouse is the single most hotly controversal balance topic in the Star Citizen community, for instance. This thing is cool, but I don't think getting one would end well for me. I got to mess around with this the other day. It was...awesome. Just about the only thing that could have made it better is if the head set wasn't hard wired. I kept feeling it around my feet. I should edit the thread title. I'm guessing Vive, since the cable isn't nearly as noticeable when you're not moving around. True on all points. The tether is a big factor in why I don't think room-scale is going to be the quintessential version of VR for a while. Though, I reserve the right to be wrong if Google's push for higher fidelity sensors pushes room-scale more squarely into the mobile realm. Honestly, I don't know. My buddy just said, put this on and I did so. Next thing I know, I am fighting giant skeletons with a sword and board. I am pretty sure I looked like a fool and at one point he laughed at me and my popping knees. I'd seen videos on youtube but nothing really gives you a feeling of what this is all about like doing it. The pock-marked visor is signature Vive, the fabric covering is the consumer version of the Rift. Humm, yea it was Vive. That's a slick ad piece, and it's showing off some very fun looking experiences. Ripcoil (the robo-frisbee one) looks like a lot of fun, and I've heard good things about Dead and Buried (the western shootout) already from demos. Wilson's Heart could be a unique enough experience with the immersion angle to make me break with my usual stance on horror/thriller games. I'm also really liking the phantom hand UI element, and I really appreciate the notion that it can loosely mimic your hand's pose because the Touch is capable of sensing that. That's Touch's killer feature, and I think that UI, and games that plug into that API (I'm assuming) will really sell that once it gets a chance to launch. It's just a shame (for Facebook, who's proving that they're not very adept at making marketing decisions when they don't already have a stranglehold on installbase) that HTC/Valve is flogging the "we beat you to market" drum in the meantime quite effectively. Anyways, that went up with a blog post announcing that there will be 30 launch Touch-capable titles, including 20 "brand-new" titles that are "designed around the immersive sense of hand presence" Touch facilitates. Looks like Rift is trying to buy the platform, quite a few games that were coming for all platforms are now "rift exclusives" or "timed rift exclusives" depending on the report. Looks like Facebook drove the money truck up to some dev studios recently. The internet's not too happy. Eh. Neither party is being particularly altruistic. Owning the hardware market is worthless. You don't make profit on the hardware, just ask Nokia. Unless you're Apple, and you can arbitrarily jack up the prices and actually increase your market's desire to pay for perceived luxury. No, this war is being fought for the API. There's a vast benefit to being the gatekeeper for which input/sensors/UI is considered the standard. It's the same thing we saw in the ATi/nVidia war back in the DirectX 9 days. DirectX 9 made the Radeon 9600 (or whichever model it was) the gold standard for DirectX rendering, and so every competitor was stuck waiting to see what tech innovations ATi would decide to put out, and then copying them. That's why the nVidia 5x00 series was universally panned -- it ran a higher z-buffer precision at a slightly slower speed and got crucified for it because nothing wanted to push deeper z-buffers and alienate a big swath of the market. Accordingly, it was ATi that got to dictate what new shader techs got built into rendering pipelines, and so on, and it wasn't until nVidia could go back to the drawing board and come out with the 6x00 line, a good 12-18 months behind Radeon's 9x00 cycle, that it could compete again. As I said, I don't see big margins in hardware anytime soon, but if you get to dictate the API, you get to keep developers on your distribution platform. Valve's "open" VR api is hardware agnostic, but make no mistake -- it's theirs. It's not an industry collaboration the way OpenGL is. It's Valve's baby, and it's completely under their control. They get to dictate the introduction of new features into it, which means that they get first crack at including it into their games, on their platform, and so on. And they do NOT want to give that up, even if/when (depending on whose rumors you believe) Oculus gets around to opening up the Oculus SDK to not require distribution on Oculus Home. All in all, though, I think the big shakeup here is Microsoft. Valve is about to see serious pressure put on their business model of dominating digital distribution. Because Microsoft just announced that they're gunning for the cross-platform market, and if you buy off the Live Store, you can play with (and maybe eventually against) your friends whether they're PC Master Race enthusiasts, or console junkies. And that's something that Valve has failed to deliver with Steam machines, which I'm pretty sure even they've given up trying to convince anybody will be a thing. Couple that with Microsoft's VR on Scorpio announcement, and I think we're going to see some compromise here of some sort. Because Microsoft's too far behind the game to do their own thing. They've got an established relationship (and a whole bunch of standardized controllers in the hands of early adopters already) on the Oculus side. And Valve is way more bitterly entrenched in its digital distribution turf than Facebook is at this point. I won't be surprised at all to see an announcement down the line that Oculus Home will become an X-Box One/PC App that serves as a gateway to VR-enabled games, and then partners with Microsoft (with some profit sharing) on the distribution and publishing end. Facebook gets its foot in the door on gathering analytics and social info on consoles, Microsoft gets to tout high quality VR experiences on BOTH its platforms, and Microsoft leverages the appeal of its Play Anywhere campaign to compete against Valve's PC store even among VR users, too. This is true, although with Playstation VR launching this fall (and compatible with current systems) and MS not releasing scorpio till "holiday 2017", it's looking like a LONG road for MS to gain any ground there. As well, every single report so far about MS's "game store" has been tragic, it's a garbage cell phone app clone store at this point (other than their exclusives). They're going to be pushing that rock up the hill for a LONG time before they get the traction. If the war is about the API, does oculus's api even support any other headsets (other than their own developed GearVR)? As the market expands and more HMD's come online, if their API doesn't support anything but their own HMD, I would think it would be a non-starter, period.